Keithley's SourceMeter family is designed specifically for test applications that demand tightly coupled sourcing and measurement. All SourceMeter models provide precision voltage and current sourcing as well as measurement capabilities. 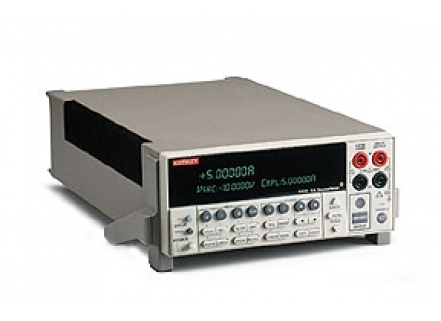 Each source-measure instrument is both a highly stable DC power supply source and a true instrument-grade 5½ digit multimeter. The power source characteristics include low noise, precision, and readback. The multimeter capabilities include high repeatability and low noise. The result is a compact, single-channel, DC parametric tester. In operation, these instruments can act as a voltage source, a current source, a voltage meter, a current meter, and an ohmmeter. Manufacturers of components and modules for the communications, semiconductor, computer, automotive, and medical industries will find the source-measure instruments invaluable for a wide range of characterization and production test applications. The Model 2440 5A SourceMeter Instrument further broadens the capabilities offered by our popular SourceMeter line. The dynamic range and functionality of our Model 2440 makes it ideal for your applications such as testing high power pump lasers for use in optical amplifiers, laser bar testers, and testing other higher power components. The Model 2440's 5A source and measure capability also extends the range of our L-I-V Test System. Manufacturers of pump laser modules, optical amplifiers, and computer, automotive, and consumer electronics products will find it invaluable for a wide range of design and production test applications.